John Coltrane’s brief career was tragically cut short in 1967, when he was taken from us by liver cancer at the age of 40. A talented saxophonist, he was a noted sideman for many artists before embarking on his own solo career. I thought that I hadn’t heard Coltrane blow a note before listening to this, but I’d forgotten that he plays on Miles Davis’ wonderful 1959 album “Kind of Blue”, which now stands as one of the most influential jazz records ever made. As well as Davis, Coltrane also played with pianist Thelonious Monk and trumpeter Dizzy Gillespie among others. He spent most of the 1950’s addicted to heroin and alcohol, which made his performances swing between catatonic and brilliant. Such unpredictable behaviour forced Davis to fire Coltrane from his band in April 1957, which gave him the impetus to finally get clean. By 1958 he was back playing with Davis as well as recording his own albums as a band leader, which would not see release until after 1960, when Atlantic Records issued his debut “Giant Steps”. Following the album’s success, Coltrane left Davis’ group and officially went solo. His ‘angry tenor’ playing style divided fans and critics alike but by 1961 Coltrane was gradually playing more soprano saxophone, famously recording a soprano version of ‘My Favourite Things’, from the musical “The Sound of Music”. This has often been remembered as his theme song. Coltrane’s style of jazz was being labeled ‘avant-garde’ or ‘free-form’, as it heavily relied on improvisational playing, rather than strict musical structure. Again, he split the jazz audience into admirers and haters. To help smooth over his critics’ negative opinions of his extreme playing, Coltrane released a number of albums in 1963 that appealed to the mainstream audience, one of note being a collaboration with Duke Ellington. His album “Crescent” from 1964 was critically acclaimed as achieving the right balance of traditional jazz and free-form. Coltrane stayed in this jazz middle ground while making his next album, “A Love Supreme”, which would earn two Grammy nominations and become his biggest seller. After kicking his drug habit, Coltrane’s life took a spiritual turn, and in the liner notes of this record, he wrote that “through the merciful hand of God, I do perceive and have been fully reinformed of his omnipotence. It is truly a love supreme.” Indeed, this album can be interpreted as Coltrane’s musical faith reaffirmation and the titles of its four movements – ‘Acknowledgement’, ‘Resolution’, ‘Pursuance’ and ‘Psalms’ – seem to confirm this. The first of these pieces features trademark Coltrane saxophone improvisations until he reaches a four note melody. He repeats this melody in different keys, while the bass and piano stay in the original. This is deliberate, not improvised, as Coltrane is showing us that this four note melody is in all of the 12 keys – an acknowledgement that this is everywhere, in all music. The melody is then sung by Coltrane using the words “a love supreme”, and is repeated like a mantra until the movement reaches its end, his voice overdubbed to create a layered effect. The music gives way to a double bass solo from Jimmy Garrison, and by the time the band comes back in, the second movement, ‘Resolution’ has begun. I think that’s a very clever way to get to the next track, as you are lulled into it; not prepared by a five or ten second silence. I also really like that ‘Pursuance’ starts with a minute and a half long Elvin Jones drum solo. For the most part, I became quite fond of this record. It lent itself well to repeated listens, and I would discover new elements on each spin. I feel that the final track, ‘Psalms’ isn’t as engaging as the rest of the album though. I have discovered that Coltrane wrote a poem that was included in the liner notes which apparently matches the slow music of the last movement. Maybe if I had been able to read along with this, I would have enjoyed it more. I think the music on this album is quite special, but I doubt it’s for everybody. “A Love Supreme” is a love letter to God, not unlike the love poems of Rumi. And the album perfectly exemplifies what it means to be at one with God. Each musician is so intently attuned to one another that it’s almost hard to believe that most of it was improvised and there wasn’t some other force at play. I often find when it comes to that stillness when you connect to God, or spirit, or whatever you want to call it, there is often no words or language for it. Coltrane seems to find that language through music. And as he takes us through ‘Acknowledgement’, to ‘Resolution’, ‘Pursuance’ and finally to the prayer of ‘Psalm’ we get a glimpse into the redemption that Coltrane found through his music. In the liner notes to the album Coltrane wrote a poem. The final track of the album ‘Psalm’ (10 minutes 45 seconds into the last track) is actually that poem spoken through his saxophone. Listening to that track whilst reading the poem really does transcend you to another place. Go ahead and see for yourself. 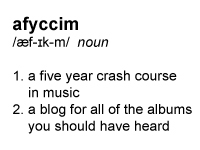 And that’s why this album is so unlike anything else we’ve ever heard in afyccim, and are likely to hear. You can’t compare it to any other album we have heard. The closest would maybe be “Black Saint and the Sinner Lady” by Charles Mingus. But even that album, despite having no lyrics, has a narrative and tells a story. 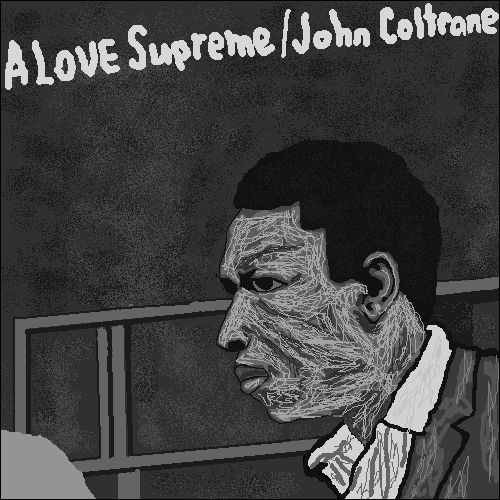 “A Love Supreme” is something else entirely. I absolutely adored and connected with this album. It requires stillness, almost a meditation like state, in order to really connect with Coltrane and his message. Dim the lights and put on a good set of headphones. Whether or not you have a belief in God is irrelevant, there is something for everyone within “A Love Supreme”. A glorious album indeed. Another hard review to write, for me, anyway. What do you say about a thirty minute, three track album that’s for the vast majority instrumental? Probably a lot, if you’re a much more educated person than myself. For a start, it’s unusual for me to listen to anything that has no guitar. There’s been other albums where pianos have been the main instrument, but there’s always one somewhere. Not here though. Coltrane himself plays both Tenor and Soprano saxophone, and carries the melody wonderfully. For only a quartet, the sound is very full, like a much larger band is playing. The thing I like most about “A Love Supreme” is how every instrument gets a turn at being the lead. Even the drummer gets a crack at the start of part three. And boy does he give it a go, until he’s rudely interrupted by a saxophone. 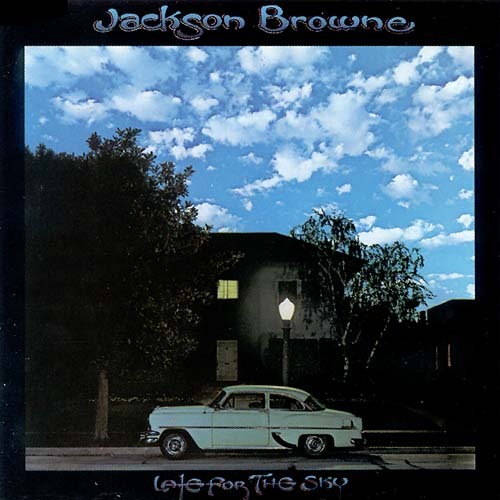 This album gave me a new appreciation of jazz players. These guys just played for half an hour straight. No breaks. I reckon they gave Elvin Jones a drum solo just so the rest of the band could have a break! I absolutely adore the sound this double bass makes, especially in the solo eight minutes in to the last movement. It’s so warm and woody and you know it’s solely relying on player skill, no effects or modulations going on here. Around the five minute mark in the first movement, Coltrane does something I’ve never heard before. He plays the “A love supreme” riff through all twelve keys, while the band stay in the original. And it never sounds bad! Apparently, the idea was that love is supreme, and it’s everywhere, so he played it right through the keys. That alone made this album worth my while. John Coltrane, crazy, or genius? This album was an interesting listen, to say the least. “A Love Supreme” is mostly free Jazz with a bit of hard bop; no rules, smudgy – messy in parts- going off on tangents for minutes at a time. There were times when I tuned out and got really irritated and wanted to turn it off because it was just noise and was distracting me from being able to write any notes (I am aware of the irony here). But then just when I was reaching for the stop button, a vibrant saxophone or almost inaudible double bass solo would break through the jumble and really surprise me with its appropriate placement or simplicity. There are moments of pure musicality and there are moments of dissonance that just grind on your nerves. As with most albums I start out hating, the more I listened to “A Love Supreme”, the more I came to acknowledge its significance, and overall, it’s complexities. This is not simply an album built around Jazz standards and featuring generous improv and self-indulgent solos. This is an album that has traditional jazz composition and theory behind it. Each song is designed with a theme and implicit message, and that really does translate from the notes on the page to the recordings. John Coltrane was a man who pioneered and popularised Modal Jazz, a style that employs the use of repeated chords as the background or framework from which the song is built as the hero instruments perform counter melodies and solos over the top. This technique features brilliantly throughout “A Love Supreme”. My overall ‘take-away’ from listening to John Coltrane, is that he was not just a fantastic musician, but he really was a real composer –and musical pioneer – in his own right, and a good one at that. And that, my friends, is his legacy.